It is interesting to me that a standard V8 camaro & mustang are increasing in price daily nearing the cost of a typical pantera. I suspect in the near future that maybe more people will see that there is value in the pantera and the demand may start increasing prices. I always hear people talk about what a Pantera is worth. If we want it to be worth more we need to donate one to a "blockbuster" movie being made. But wait, Is that what we want? If we want to buy one, or to buy parts a higher price is bad. If we want to sell one it's good. I guess inside we would like the prices to be better for our ego. We know what an awsome car they are, we just want the world to see it too. So what is better, more value or not? I think 25K-35K is a great range for the car to be in. Any cheaper and people will just rag them out, any more expensive and they become hard to afford. I've got mine. You can raise the prices now. At this point, it doesn't matter to me if the prices go up, down, or sideways! I could've bought a hundred different other cars, but I bought a Pantera because it encompasses all that I want in a car. It is my dream car. I don't ever see myself parting with it. Although it would be nice to see the prices climb, I don't care if they went down to zero. After all, even if they were given away for free, no more are being made and it would still be an exclusive (and exciting) club to be a part of! The investment I made in my Pantera is recouped every time I get behind the wheel (even if it is just in my garage on jackstands)! I am just glad I can ditch the real estate and stock market and buy up the old Corvairs. I was happy to just see the Pantera mentioned however. Shopping around in the last two years, I've found that a 'good' car was closer $35K, or so. I think the WSJ is using 'old' info. Panteras are not easy to appraise. They differ so greatly between models that seldom, do we find them comparably equipped. A high-end paint job alone can drive the price up by $5-10K especially if it is done in bare-metal fashion. A major engine upgrade, ZF overhaul and brake conversions to Brembo or Wilwood would also deserve a premium. Thus, a naked conclusion of a range of $25-35,000 is nearly meaningless and is very misleading to me. In the Corvette or MoPar world, a matching number- bone stock example can be compared in values because there are auctions and comps to utilize. In the Pantera world, we seem to be plagued with "authorities" that get some type of gratification in placing these off-the-wall valuations on our cars. Further, some owners seem hostile and will criticize those who seek a higher price for their car, as if this is something sinister or "greedy". Few owners can ever realize a return on their total investment, even in the high-dollar sales that have been obtained recently. These cars are still a great value, even at the high end of pricing. 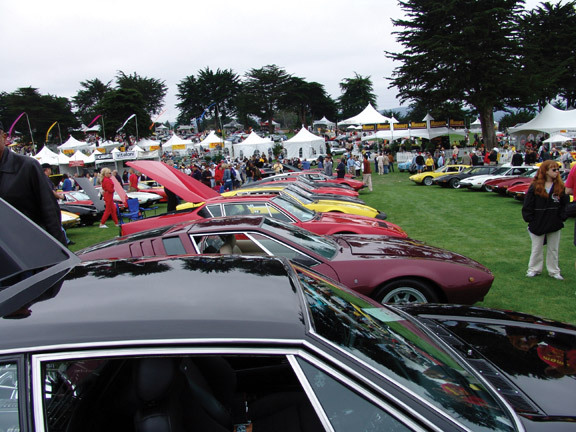 They are far less than a new Corvette or Viper and I don't know of any vintage race or serious, all- Italian Concours that will permit these other, more costly sportscars to participate. Regarding prices for panteras,, all one has to do is minipulate the market ( price ) and the prices will rise very quick.. We do this in realestate by buying homes in a designated area, (say 30 homes ) a year later put them all up for sale at a very high price and with in a few months the price climb do to minipulating the market,, can also work with cars. I agree, I got two! I believe the "average" car is still under-valued, especially compared to the other cars one can get in the price range. But it is better to enjoy a possession than worry about it's value. I say anyone selling a Pantera from here on out! Sell it for 20k higher then you think you want and the prices will climb. Guaranteed.